Works where ordinary cleansers fail! For Use All Around the House! Removes rust & hard water stains. Cleans countertops, ceramic cookware, and pots and pans. Zud Multi-Purpose Heavy Duty Powder Cleanser Works Where Ordinary Cleansers Fail! For Use All Around the House! Removes Rust & Stains. In the Kitchen ZUD Heavy Duty Cleanser removes stains from porcelain sinks and stainless steel sinks. 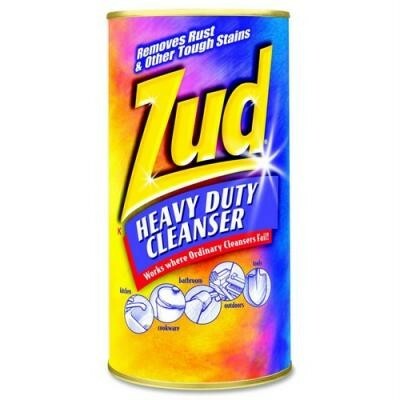 ZUD cleans countertops, ceramic cookware, and pots and pans. In the Bathrooms ZUD Heavy Duty Cleanser cleans and dissolves embedded rust and hard water stains in the toilet bowl. ZUD removes blue copper stains, mineral deposits and other discolorations in the bathtub, and on the shower tile and grouting. Cleans copper, brass, aluminum, iron, pewter, ceramic, and stainless steel. Zud also cleans rust and corrosion from barbecue grills, boats, and aluminum storm doors and windows. For Use All Around the House! Removes Rust & Stains. Removes stains from porcelain sinks and stainless steel sinks. Removes mineral deposits and other discolorations in the bathtub, and on the shower tile and grouting. Removes rust and corrosion from barbecue grills, boats, and aluminum storm doors and windows.